3. 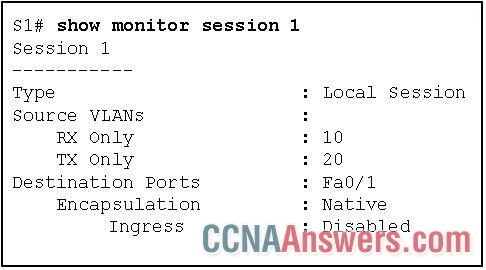 Which statement describes the function of the SPAN tool used in a Cisco switch? 5. Which statement describes SNMP operation? 8. Refer to the exhibit. Based on the output generated by the show monitor session 1 command, how will SPAN operate on the switch? 10. What is a drawback of the local database method of securing device access that can be solved by using AAA with centralized servers? 12. The exhibit shows a network topology. On the top, there are two routers, labeled R1 and R2. Under the two routers, there are two Layer 3 switches, labeled DS1 and DS2, . Under DS1 and DS2, there are three Layer 2 switches, labeled AS1, AS2, and AS3. Both R1 and R2 have two connections, one to DS1 and another to DS2. DS1 and DS2 each has three connections, one to AS1, one to AS2, and one to AS3. PC1 is connected on switch AS1 and PC2 is connected to switch AS2. There is a DHCP server connected on switch AS3.Refer to the exhibit. PC1 and PC2 should be able to obtain IP address assignments from the DHCP server. How many ports among switches should be assigned as trusted ports as part of the DHCP snooping configuration? 13. Which statement describes the RSPAN VLAN? 14. What protocol is used to encapsulate the EAP data between the authenticator and authentication server performing 802.1X authentication? 16. The exhibit shows a network consisting of a router, two switches, a DHCP client host, an attacker host, and a DHCP server. Switch S1 shows four interface connections: G0/1 to the DHCP client, G0/22 to switch S2, G0/24 to router R1, and G0/23 to the DHCP server. The attacker host is connected to switch S2.Refer to the exhibit. Which interface on switch S1 should be configured as a DHCP snooping trusted port to help mitigate DHCP spoofing attacks? 17. Refer to the exhibit. What can be concluded from the produced output? 18. What network attack seeks to create a DoS for clients by preventing them from being able to obtain a DHCP lease? 19. Which protocol or service can be configured to send unsolicited messages to alert the network administrator about a network event such as an extremely high CPU utilization on a router? 20. Refer to the exhibit. 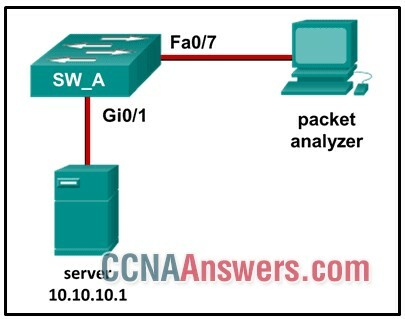 Which command or set of commands will configure SW_A to copy all traffic for the server to the packet analyzer? 21. What are SNMP trap messages? 22. Refer to the exhibit. A SNMP manager has IP address 172.16.1.120. 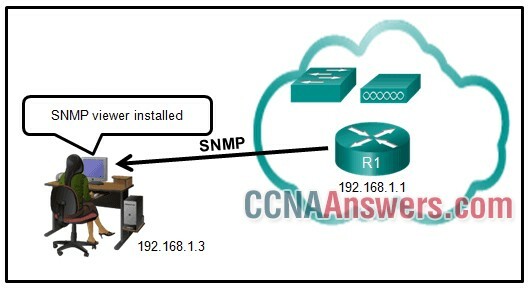 The SNMP manager is unable to change configuration variables on the R1 SNMP agent. What could be the problem? 23. What is the behavior of a switch as a result of a successful CAM table attack? 24. When using 802.1X authentication, what device controls physical access to the network, based on the authentication status of the client? 25. What is the function of the MIB element as part of a network management system? 26. Which SNMP version uses weak community string-based access control and supports bulk retrieval?